I was looking forward to reading Allegiant as I’m a big fan of the Divergent series and was wondering how it would all end. In the final instalment of the trilogy, after Tobias releases a video to the public revealing the truth about the faction system, everything starts to crumble. Evelyn takes over as leader of the city and forces everyone to become factionless, but not everyone is happy with the new order. 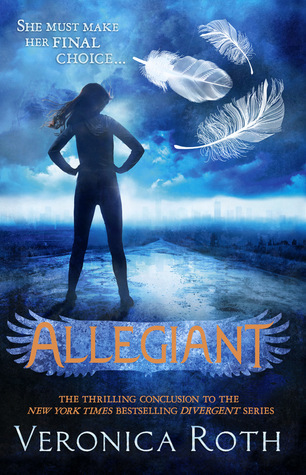 A rebel group called the Allegiant are determined to escape the city, find out the whole truth about their existence and reinstate the old way of life. Finally, Tris and Four venture beyond the walls of Chicago to discover what lies beyond. A lot of the questions that arose during the previous two novels are answered-like why the faction system was set up in the first place and exactly who or what exists outside the city. I wasn’t completely satisfied by the ‘big reveal’, as I felt the reasons for establishing the faction system didn’t really make sense, so that was a bit disappointing. There were also some threads of the plot that I felt weren’t fully developed or explained. But there were some interesting revelations that intrigued me and some nods to classic dystopian novels like Nineteen Eighty Four. Some things we learned in the previous books turn out to be lies. The main thing that separates Allegiant from its prequels is that it’s told using a dual narrative-the chapters alternate between telling the story from Four’s point of view and from Tris’ perspective. To be honest, I found that it didn’t really add anything to my experience or reveal anything interesting about Four. I felt that the two voices weren’t very distinctive-so much so that at times I wasn’t sure whether it was Four or Tris narrating, so it got a little confusing. Allegiant was a very emotional read. Some characters that I had become fond of don’t get the happy ending they deserve and the relationships between the main characters seem to break down. There’s tension between Tris and Caleb as she can’t completely forgive him for his earlier betrayal. Tris and Four’s relationship, normally the ray of sunshine that lifts the series from a dark place, also takes a bit of a nose-dive in this book as they have a lot of trust issues and end up fighting or ignoring each other at some points. It was really sad to see their relationship falter like that and was quite hard to read, as normally their romance provided some much-needed comfort and light-heartedness. That’s what it’s all about it, isn’t it? Tris and Four’s individual character arcs were really interesting. They both discover a lot about themselves and their families in this book and we get to see how they handle some pretty difficult home truths. But Tris remains as frustratingly stubborn and rash as ever and sometimes I was willing her to make different choices as I knew she was making a big mistake! This is in-keeping with Tris’ character, though and makes her very believable. She’s far from perfect and if she didn’t make mistakes there wouldn’t be such tension in the novel. Which leads me onto the ending. Oh, the ending! It’s obviously been much discussed all over Goodreads and the blogosphere and sadly I had already seen a major spoiler so I knew in part what was going to happen. That still didn’t stop ‘all the feels’! I know that a lot of fans were angry and upset at the conclusion, but I honestly feel that Roth was right to end the series the way she did. Although it wasn’t the ending that I personally wanted to read, it fitted perfectly with the events that had taken place earlier in the series and was a true reflection of the characters’ motivations all along. I think Roth made a brave decision to preserve the continuity and authenticity of the series. Overall, Allegiant was a very exciting, interesting and emotional end to the Divergent series, although I wasn’t entirely satisfied with the explanation for the faction system and I felt some aspects of the plot weren’t fully developed. I would definitely recommend that fans of the series read it for themselves and form their own opinions. Have you read Allegiant? What did you think about how the series ended?